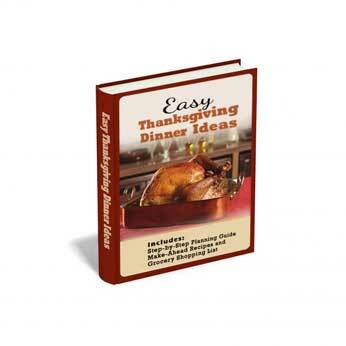 to sell a 33 page e-book on Easy Thanksgiving Dinner Ideas. I have been answering questions for years on how to make a traditional Thanksgiving Dinner. Even I use this guide myself each year when I cook Thanksgiving Dinner for family and friends. This book covers absolutely everything from selecting a turkey, how to brine a turkey, a step by-step to do list for the weeks leading up the Thanksgiving day, all the recipes I have been making for my family for years and even a detailed grocery shopping list. Affiliates will receive 30% commission on all books sold, minus any requested refunds. I will pay out at the end of each month. This book is for sale for $7.95, so as an affiliate you will earn $2.38 for each book you sell. You could go to the store and plow through tons of magazine recipes and take the time to make out a shopping list and plan yourself, but I can make your life so much easier by sharing the plan that I've used successfully for years. If you have readers or followers who will be cooking a turkey this year you can help them out and earn a few bucks yourself by signing up for this affiliate program!